Hughton in the dugout last night at Stamford Bridge. Image courtesy of John Patrick Fletcher on Getty Images. 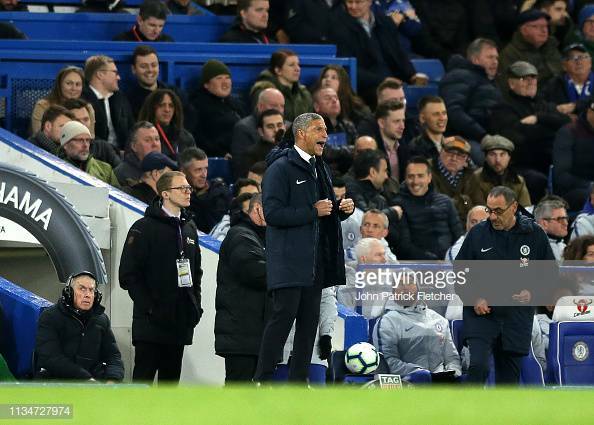 Hughton gave his view on the recent race row in Italy, team news ahead of Saturday's FA Cup semi-final and VAR. Brighton & Hove Albion manager, Chris Hughton was disgusted by the behaviour of Cagliari fans towards Juventus striker Moise Kean during their 2-0 win on Tuesday. Asked about it in his pre-match press conference Hughton had the following to say: “Well certainly disgusted by the reaction of a crowd towards an individual. Am I surprised, I think we probably have got to the stage now where there are not too many surprises in the game. Probably with the coverage we have now of all the games throughout Europe we have seen it more. But I think it’s disgusting and there is absolutely no doubt there have to be stricter penalties, as this is so clear and obvious for everyone to see. Hughton also spoke about how players could have a big voice if racist behaviour continues:“I think it has to come up as ultimately the responsibility is down to the authorities, so if the authorities are not going to come down on it with stricter penalties, whether that’s teams playing behind closed doors, weather that is it increasing the very minimal fines we have seen. The Brighton manager gave team news with Jurgen Locadia missing from the 18 in the defeat to Chelsea and Solly March going off injured: “Well at this moment the only one that we know that definitely won’t make it is Pascal Gross, so we have known that for a little while. We assessed Solly March this morning and the good news is that although he felt his calf, he felt it just tighten a little bit it certainly doesn’t feel like a pull. Hughton also gave his take on the decision to VAR decisions on the screen so fans can see during the game on the big screens at Wembley: “That I don’t know, personally at this moment I am not so much for that. I am for VAR, I probably wasn’t but I like a lot of us in this position have been persuaded because one we know it’s going to come in, and I think it will be good for our game.